Home Life Style Hoverboard Ride 101 Tips: Get, Set, Started! Gone are the days when we had simple cute manual scooties and skates to have fun on the go! With the evolvement of technology, we have now been introduced with the much-upgraded versions of self-transportation like hoverboards and Segways. But despite being the coolest ride of the time, many people still hesitate to ride a hoverboard just because they are not sure whether they could do it right or not. However, the availability of a vast majority of online tutorials and guides, to help all those who would love to buy a Segway hoverboard for sale but want to learn to ride it first, here are some tips for you to catch! Learn carefully to ride fearlessly. Okay, here is the first thing. You won’t be riding it if you won’t dare to step on it! Don’t be afraid as these self-balancing vehicles are pretty much safe. But make sure it is switched on. Please restrain yourself from standing on a switched off hoverboard, as it could literally cause you a leg or something by making you fall off it. Power on the hoverboard (most have a silver button on the rear of the board) and, if your hoverboard offers it, select the appropriate beginner riding mode. 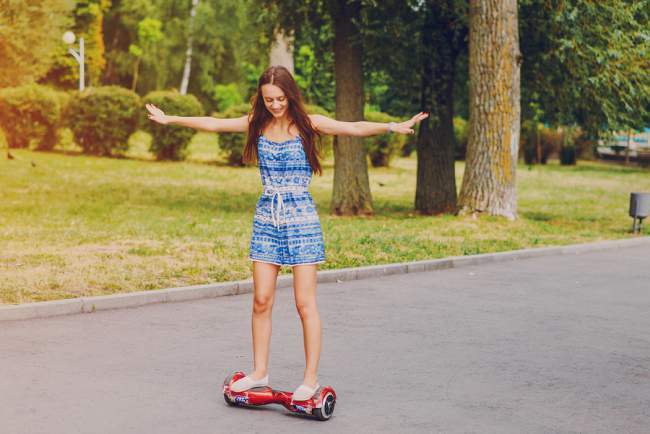 Now make sure both your feet are as wide as possible on the10 inchhoverboard. This will help you ride and balance it more smoothly. Now the question is, do we really need to do any efforts when hoverboards are self-balanced. The answer is yes! Of course, they do balance electronically on their own but you might wobble at first until you learn to find your center of gravity. You can ride it near a wall at first just to gain confidence in the beginning. While it’s pretty easy to get over the hoverboard, directing it can be the tricky part. You would probably have to learn to use your legs for giving the directions. The concept of movement is simple – you lean forward to move forward and lean back to slow down and reverse. Make sure you bend your knees to get better control of the speed, and remember to slow down with plenty of time – the last thing you need is to hit an obstacle and go flying off. To be stable and flexible at the same time. Turning is also a part of direction thing but would probably have to learn to apply a bit of pressure and balance. Each side of your hoverboard is somewhat independent of the other, allowing you to twist each side. To turn left, push your right foot forward, and to turn right, push your left foot forward. It may sound very problematic but once you learn it, nothing is more fun than riding a smart hoverboard. Well, that’s easy! You just have to make sure one thing. Step down backward instead of forward otherwise, you can have a fall.